Our Vision Board Experience Program is like no other! Contact us to become our Visionary Queen Liasion . This event is for Women who realized their potential and are ready to elevate to the next level. This is an experience that you do not want to miss! From our motivational guest speakers, successful Womenpreneurs and Book Authors to a fashion show hosted by a talented local fashionista, this experience will trigger the desire for you to set forth in taking those steps to becoming closer to greatness! Vision boards are visual aids that help keep you motivated. But, a Dynamic Participators Vision Board Experience will not only keep you focused on your mental, physical, and spiritual goals, we will create an atmosphere of positivity and sisterhood that will give you the drive to pursue goals you doubted you could achieve. 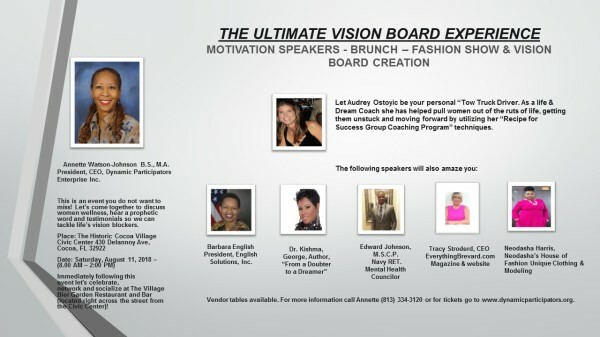 We have strategically placed phenomenal speakers, testimonials, and creative activities into this event to enhance your vision board experience. This will allow you the opportunity to be the energy you want to attract. Just bring your positive attitude and be prepared to have an awesome experience. Yes, there will be goodie bags, raffles, and door prizes! Catered brunch with a fashion show by a local fashionista (Neodasha’s House of Fashion Unique clothing and Modeling)! Immediately following this event let's celebrate, network and socialize at The Village Bier Garden Restaurant and Bar (located right across the street from the Civic Center)! Tickets will sell out so get your tickets to secure your seat. Free street parking. This event is about 10 minutes from the beautiful Cocoa Beach. Excellent vacation destination or planned girls trip. http://www.cocoabeach.com/. Do you want to be one of our "Visionary Queens"